I couldn’t take it anymore. I no longer wanted to answer to the heart beating on my ribcage, my sweat on my palms, or the breath that got caught in the upper part of my lungs. I wanted the swirling thoughts in my brain to settle. I imagined them falling like leaves finding their place on the ground after a gust of wind forces them into a cyclone. Driving my daughter to daycare, I couldn’t calm myself. We had just moved to a new town in what was our last relocation. Over the past thirteen years, my husband and I had moved across the country and lived in several cities—Baltimore, Milwaukee, San Diego, Winston-Salem, NC, Oxford—and I was tired. Tired of the stress of packing and unpacking our things. Tired of finding new doctors. Tired of making new friends. Tired of setting up daycare for my toddler. Tired of finding her new therapy providers to address her gross motor delays. Tired of finding new babysitters. Tired of rebuilding our home. If tired had been all I had felt, I may have coped better. But, as always, anxiety was there. Like a childhood friend—or foe, or frenemy—it never leaves my side. As long as I have had memories, anxiety tagged itself in. So, when driving my daughter to her first day at a new daycare, my thoughts were sent into a tailspin. It wasn’t until this last move, during that drive down yet another College Avenue in yet another new city, that I realized my anxiety was something I needed to deal with. I asked myself: What if my daughter sees this? Will she learn to live in fear? Will she worry about big things and small things, just as I do? Will she learn to stress over things she cannot change or that have yet to happen? Will she see my tears on our way to her new daycare and wonder if she, too, should be crying? My daughter is fun-loving, silly, humorous, and independent. Life never gets her down, even though she was born eight weeks early, spent five weeks in the NICU, and continues to struggle with muscle weakness. She cannot run with her friends on the playground. Yet she has friends. Lots of them. All of the children in her classroom call out “Evelyn!” when she arrives in the morning. Teachers from the other side of the building know her. It may be because she uses a walker, or because she has special braces on her feet. More likely, it’s because of her outgoing personality and willingness to try anything. She has an empathy that cannot be taught. She pats babies’ backs when they cry. She hugs me when I look sad. At snack time, she shares her crackers. She always wants to play and is sure to include others. All this and she is only three. She never worries what others will think of her slow walking. She just walks. She never judges others for being different. She just plays. She never worries about hiding her disability. She just sits down with the group of children playing with the Legos. During that drive, with the tears streaming down my cheeks, I knew this excessive angst was something I should not pass on to her. She deserved better. My daughter needed a mother who worried less and enjoyed more. A mother who could show her that happiness is found from within. I wanted her to learn that she is worthy of a peaceful life. At this point, my suffering had spanned thirty-six years. As a child, when I had started a new grade in school, I cried the night before. When we visited relatives’ homes, they would call me “bashful” or “shy” or some equivalent when really I was none of those things. I wanted to engage more, but fear of saying the wrong thing held me back. When I started college, I was certain I would fail. My dream of studying abroad was almost squashed by fear of living in a new country. I was afraid of learning to drive, going to school dances, and being invited (or not) to birthday parties. Even attending Girl Scout meetings in grade school meant I had to interact with others whom I feared didn’t like me. I never knew if that was really how others felt. My anxiety didn’t care about truth. Anxiety whispers to me: You’re not good enough. You’re not smart enough. You’ll fail at that. No one will like you. You can’t do that. And then the questions start: What if you get lost? What if you have to eat in front of strangers? What if food gets stuck in your teeth? What if your car breaks down? What if…. So, by the time we reached my daughter’s daycare, when the tears wouldn’t stop, I had had enough. I vowed to get help. That night I found a therapist who has taught me the importance of my anxiety. “The anxiety won’t completely go away,” my therapist told me. Even though I had hoped she had the secret to an anxiety-free life, I knew she was right. Anxiety is natural. It is useful. Just not at my level. I explored it, feeling its crevices and textures. It’s a part of my personality. It makes me me. Anxiety was not the problem. My inability to cope was. Allowing it to take over my thoughts until I became frozen was. Now, I’m learning to accept myself. I check in with myself. I allow myself to feel what is there, yet I can step aside enough to analyze what is really happening. Through our therapy sessions, I found compassion for my anxiety. It’s there to tell me something. It often points out the paths in life that are most worthwhile. My instinct to fight back, to push myself through the angst, was right. Each time I face my anxiety, I come out the other side victorious. Yet the energy drained from me each time leaves me fatigued. As I reach each threshold between relenting to anxiety or jumping into something something fearful, exhaustion fills my body. I feel as if I could go to sleep and never wake up. “I don’t want to have to force myself to do things every time I get anxious,” I told my therapist. Being proud of myself for my achievements despite my anxiety never occured to me. My anxiety didn’t have to be my enemy. It wasn’t the harrowing fight between knight and fire-breathing dragon that I thought it was. My anxiety tested me, pushed me, and ultimately made me who I am. Accepting it would not be conceding, but rather it meant I could live with more sanity. It’s not easy to live with anxiety, but with the aid of a few goals, my days now start with more purpose and end with more peace. Through my self-exploration, I found a mantra that recenters my focus from one of fear to one stillness; Feed my mind, body, soul. I found a way to leave my ego on the side—that which feeds my negative thoughts about myself—and relax into the present moment. Days on which I manage to include all three elements of focus, I feel the most calm. It takes work to achieve them all. One usually fights to take on more weight than the others. But when I insist on balance, I can settle my rattled brain for at least a little while. I do this work daily. The triangle image hangs in my thoughts as I try and balance each side into a perfect equilateral shape. When achieved, I go to bed feeling like my soul has evened out. As my therapist had suggested, reframing my self-language focuses on the mind. Just as my daughter can find compassion for the people around her, I am learning to find compassion for myself. I’m not broken. I have emotions and needs and fears. I can allow those to exist. I honor them for what they are while also finding pride for choosing the tough road time and again. Giving my mind a safe place to find quietness has also enhanced the this portion of my triangle. But when the battle is with anxiety, that is a difficult feat. Meditation is tougher than I thought. ‘Doing nothing’ is actually doing quite a bit. Yet, when I am able to put aside the noisy chatter in my head, the peace is exhilarating. At times, when the anxious voice is shut out—along with all of the upcoming things I should be worrying about—I feel as if I am floating off my couch cushion. 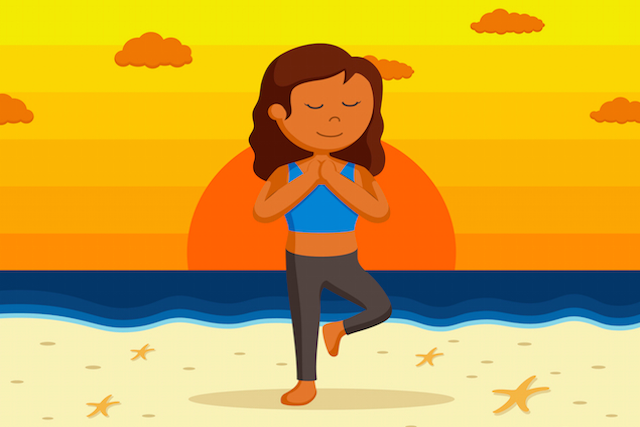 Yoga, kickboxing, Zumba—all help drain the anxiety from my body. As the sweat glistens on my skin, the anxiety has no place to be. My heartbeat increases, my blood flows freely, and my focus is on finishing the workout. My body feels cared for. I feed my body foods it needs to thrive. I’ve cut back on coffee and leaned more on tea. Fruits and vegetables find their way into every meal and snack. Sugar is limited, although to ban it altogether would go against what is good for my soul. My soul begs for me to feed my own inner energy. I engage in activities I enjoy, even when I don’t think there are enough hours in the day. I nurture myself. Through writing, I find great solace. It’s meditative and brings me a joy I cannot find elsewhere. Sentences and stories flow through my head, often taking the place of the anxious ones. Just like anxiety, I was born this way. Since childhood, I’ve liked storytelling. The more time I schedule for writing, the less time anxiety can claim. I cook. Providing nutritious meals for my family is a privilege. When engaged in new recipes, my focus shifts to one of worry about the future to one of creating something to enjoy. I even find time to watch my favorite television shows. When my daughter is at school, and my husband is in the office working, I take my lunch to the couch and turn on Netflix. I often find the comedies. When something can make me laugh when I’m alone, I know it’s the distraction from the tough parts of life that I need. I am a work in progress. Some days, anxiety sneaks up on me. Panic can be overwhelming. Instead of criticizing myself for being weak, I allow the feelings to come. I try to slow down. I accept that in that moment, I feel overwhelmed. It will pass. Now, when I drive my daughter to daycare, I don’t cry. I sing. I no longer worry about what the driver next to me will think when he sees my mouth moving and hands tapping. My daughter and I say “hi” to the busses on the road. We pretend her stuffed Elmo is driving, and we laugh at her silly jokes. She tells me to go “this way” and points the wrong direction to which I respond, “no, this way.” That banter always makes her giggle. We talk about which friends will be at school and what she’ll play outside. Through it all, she smiles. And now, so do I.
Laura Gaddis is a mommy to four babies—three angels and one happy toddler. She shares her life on her blog Sophia’s Story. Laura writes about pregnancy loss, parenting, and anxiety. Her personal essays have been featured on Scary Mommy, Still Standing Magazine, and The Mighty. She can be followed on Twitter @Sophia_Story and Facebook at her Sophia’s Story page. The post Anxiety Is Not My Enemy: How I’ve Learned to Accept It And Cope appeared first on Tiny Buddha.